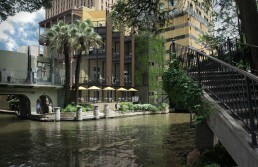 This architectural intervention, an appendage to a historic structure in downtown San Antonio, adds a link to the famed River Walk, expands the building’s floor plates with stacked balconies, and activates a long-dormant bookend of the block. 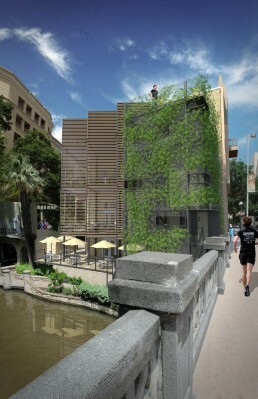 The vine-covered elevator and stair core with steel framed openings presents itself as an inhabitable vertical garden extending up from the verdant waterway below. 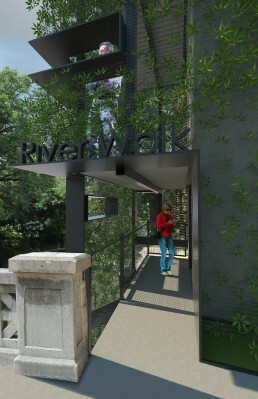 Its placement provides direct public access to river level and acts as a buffer between Commerce Street and intimate River Walk dining. 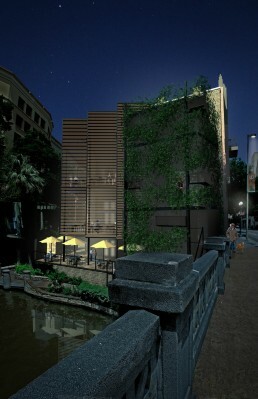 Three three-story fins rotated open thirty degrees direct dining views to the cypress-lined riverbank to the northwest and mitigate harsh western solar exposure. 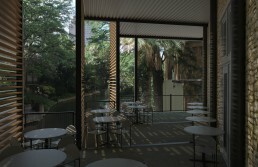 Horizontal wood slats allow air flow and views while filtering sunlight. 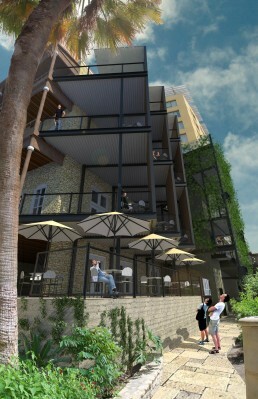 The balconies are saw-toothed in plan providing additional room for dining and formally differentiating them from the rectangular historic north-side balconies. Matching wood species and stain of new and old balcony components set the two in dialogue.